Availability: GOG.com has it for cheap. Also boxed with the Elviras in an old compilation release. 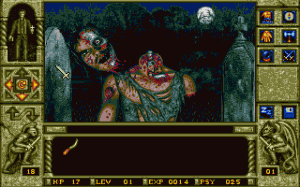 HorrorSoft had already made a name for themselves with the surprisingly gory games in their Elvira series. 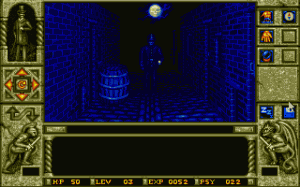 Waxworks is a semi-official third game in that series. 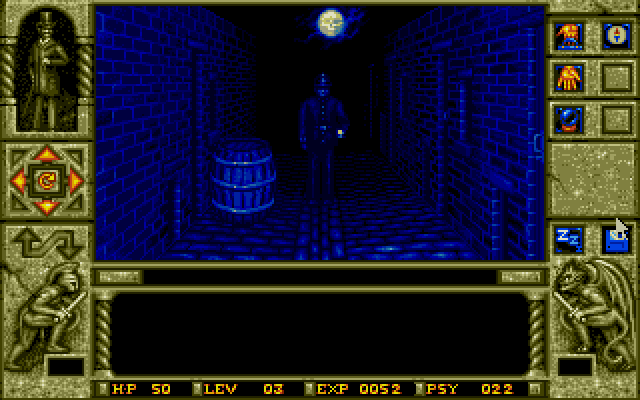 Though Elvira no longer acts as horror host to the proceedings at hand, the gameplay here is essentially identical. If you’re not familiar with this series, or HorrorSoft at all, then let’s take a look at the one that – as there’s no third-party license involved – will be the easiest to find today. Bumping into the police ends your London trip on the spot. You have been summoned to your uncle’s waxwork museum, whereupon the Lurch-like butler hands you an orb and ushers you into the exhibit hall. There are four displays here. Similar to Elvira II’s studio doors, each one transports you to a different adventuring locale. You’ll climb to the top of a pyramid in Egypt, battle a monster that has taken over a 19th century mine, fight through a graveyard packed with the undead, and tangle with Jack the Ripper in 18th century London. In each case you’ve hopped into the body of one of your ancestors, and will ultimately have to defeat your evil twin – who is always at the heart of whatever horrors have befallen that particular land. It’s a fun system that allows for some variety, as you’re free to choose which waxwork world to tackle in which order. Each also features a slightly different focus and set of challenges – for example, there’s no combat at all in London, while the graveyard is all about carving through the undead. The only trick is that once you enter a waxwork, you can’t leave it until you’re through. They’re also completely self-contained, so any progress or experience you collect in one doesn’t transfer over to the others. You’ll still need to beat all four to open up the endgame, but you won’t be bouncing around between them at will. You’ll use a first-person interface to navigate the worlds. Movement is grid-based and restricted to 90-degree turns – this is basically an old dungeon crawler. The keyboard works best here, but you can also click an arrow panel, or along the edges of the view screen to get around. Nearly every item in the world can be interacted with in some form – click it and a panel of contextual buttons appears to the right. You can open chests, look inside pots, search bodies, etc. Anything that requires further investigation (like a puzzle or a diary) gets its own close-up screen. You can further grab just about anything you see (much of which is junk) and store it in an inventory panel running along the bottom of the screen. Combat is the other key feature here. As you explore, you’ll find weapons you can equip. Enemies to use them on will eventually saunter up and start throwing blows. You’ll click the combat button to bring up your currently-equipped weapon, and click on the body part you want to attack. The attack changes based on where you click, with thrust attacks to the torso and slashes at the limbs. You will see damage build up accordingly, from visible gashes and cuts appearing, to cleaving off entire limbs when fighting a rotting zombie. Numbers on the left of the screen show the exact damage value of your last attack, so you can get a general idea of how effective your attacks are (and try something different, if needed). Unlike the first Elvira, there is no block/parry system – you simply trade blows until someone falls. Instead of skill or tactics, your experience defines how strong you are at combat. This experience is gained simply by walking around. Any time you enter a new square on the invisible grid, you’ll gain a point of XP. After enough points, you’ll get a level. Each level restores some health, while also increasing both the damage you cause and the accuracy of your blows. 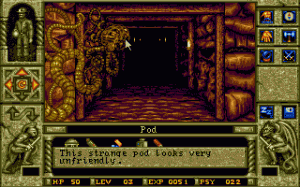 Better weapons can also be found around the levels, some of which are more effective than others. Your other source of health is your helpful uncle. The orb you were given allows you to contact his spirit at any time, whereupon he will offer hints, general advice, or the limited ability to heal. Restoring health will always require some object found within the world, and the ease of finding it roughly defines how much health you’ll get back. 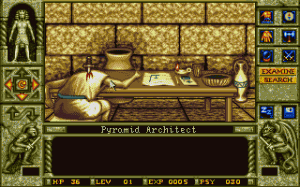 Every bit of assistance requires spending “PSY” points, which are also restored slightly at each level gained. Run out of PSY and you won’t be able to use the orb anymore, so you’ll want to keep the uncle-pestering to a minimum. 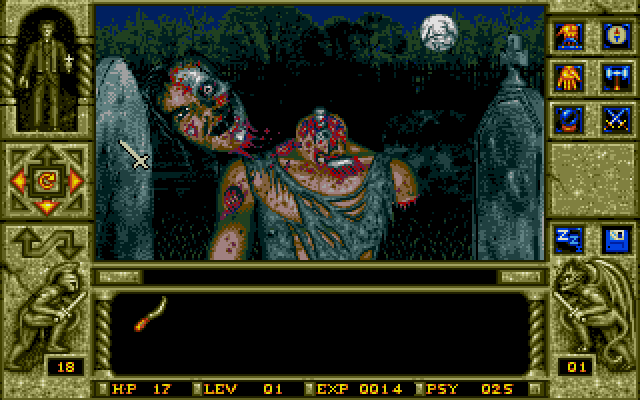 I would be remiss if I didn’t mention the gore, because HorrorSoft isn’t shy about it. This is an astoundingly violent title, and you can tell they reveled in each and every death image (some one-upsmanship among the artists was probably involved). It’s all hand-drawn, so how actually “gory” it is comes down to personal opinion. Still, you’ll see throats that have been torn out, eviscerated bodies, limbs in the process of being torn off, and so on. (Warning – example nastiness ahead!) If you like gross-out horror, there’s plenty here to drive you toward seeing what grisly image will be served up next. If you’re not a fan, well, this title pretty much isn’t for you. 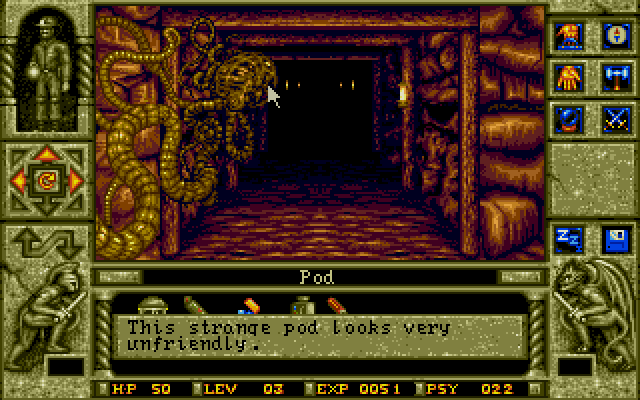 Spoiler: The strange pod is totally unfriendly. The biggest issue I personally had was the lack of a map. A compass is truly your only help here, and it really only helps you in drawing your own map on paper – something which I have stated many a time that I am not willing to do. 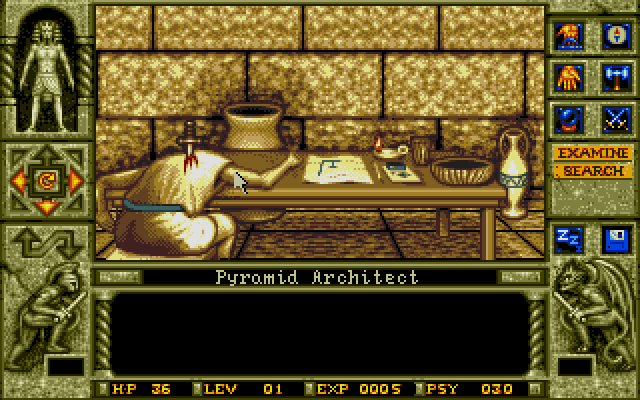 Unfortunately, it’s almost a requirement here, simply because of the way the graphics are rendered. Locking you to 90-degree movement allows images to be reused and mirrored often. It reduces the size of the game and the workload of the artists, but means that the vast majority of the hallways in each waxwork look exactly the same. It’s not just limited to the pyramid and mine (obvious headaches); London’s streets are maze-like corridors of identical shops and alleys, and the graveyard forms a similar maze from tombstones and blocked pathways. If you have the time (and patience) to wander around, these areas aren’t incredibly large. Defeated enemies stick around, and so can be used as landmarks. If you’re gaining experience, you’ll also know that you’re forging a new path. But if you have a terrible sense of video game direction, you’re going to get incredibly confused. The package doesn’t even contain a map, so you are truly on your own here. Plan accordingly. Combat can also be a bit frustrating. You’ll miss most of your strikes at the beginning of each waxwork, and the only way to remedy this is to gain experience. While London is built heavily around avoiding police and mobs (a nice change of pace), sections like the pyramid give you nowhere to run when a guard approaches. Nowhere to run means no way to get XP, so prepare for lots of clicking until the invisible die roll in your favor and you can finally land a scratch. Alternatively, keep an eye out for other things to use in place of weapons (for example, you don’t have to take on the first plant-man in the mine with that puny screwdriver). Aside from re-using each still heavily, graphics aren’t bad and look the part. Whitechapel is moody and moonlit, with a nice waterfront view if you can find it. The graveyard is expertly spooky with plenty of shadowed gravestones and trees off in the distance. The pyramid overuses sandstone block walls (obvious), and the mine does the same with rock (also obvious), so these areas tend to be the least visually interesting. Still, it works, and there’s never confusion regarding what you’re supposed to be seeing and what up ahead is about to kill you. You usually won’t even need the text description to know what you’re picking up. Music is pretty good, and they certainly make some interesting instrument noises out of what they have. It’s warbly though, which was common for the time, and very shrill in many places, which was not. You can turn the music off by pressing the M key, though that will leave you with just the sparse effects. Mostly these are just “whiff” noises in combat of swords slicing through the air. There’s no voice work, and no use of sound to indicate clues. As a general rule, I hate maze games, but Waxworks grew on me. Areas are small enough that simply stumbling around can be an effective solution, and the gameplay itself is enjoyable enough to keep adventure fans interested. There’s a certain level of randomness to the combat that often feels cheap, and there are plenty of insta-death traps if you’re not paying constant attention, but both of these can be mitigated by saving often. In short, it’s a decent adventure that has held up pretty well. I can’t give it a glowing recommendation, but if you like the sound of what you’ve read here, it’s probably worth checking out. Logical puzzles, easy interface. Each of the four waxworks has a different tone and slightly different challenges. Tons o’ guts!